Hubs, baby and I are attending a wedding and I need an outfit and of course nothing in my closet will work in its current state! 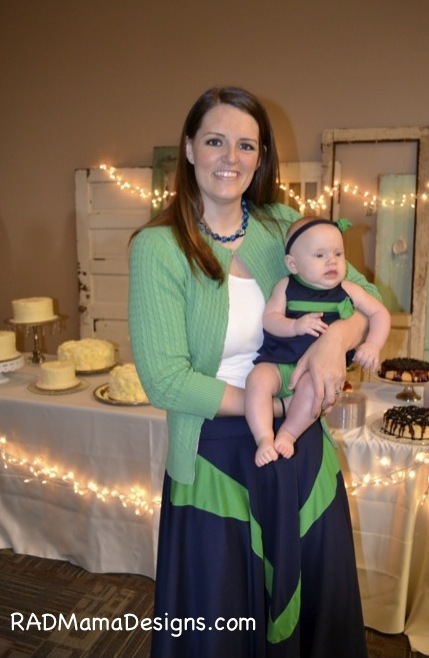 So I saw this circle skirt tutorial on icandyhandmade and MADE. Now I couldn’t get any cute striped knit locally or online in time for me to construct an outfit while taking care of a baby. I decided to keep it simple with some navy knit that was on sale at JoAnn’s but after I started it was too simple so I added a color block. 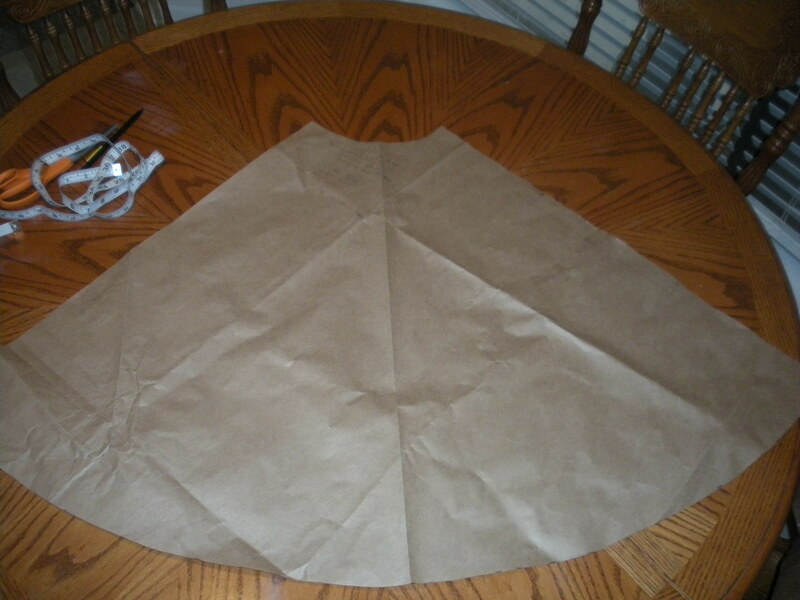 Here is my tutorial for the wedding circle skirt. *I had a picture framed and it came wrapped in this thick brown paper. Worked great for pattern pieces but you could use several pieces of freezer paper taped together or the opposite side of some cheap wrapping paper. I followed the tutorial listed above for cutting out the pattern piece and produced this. 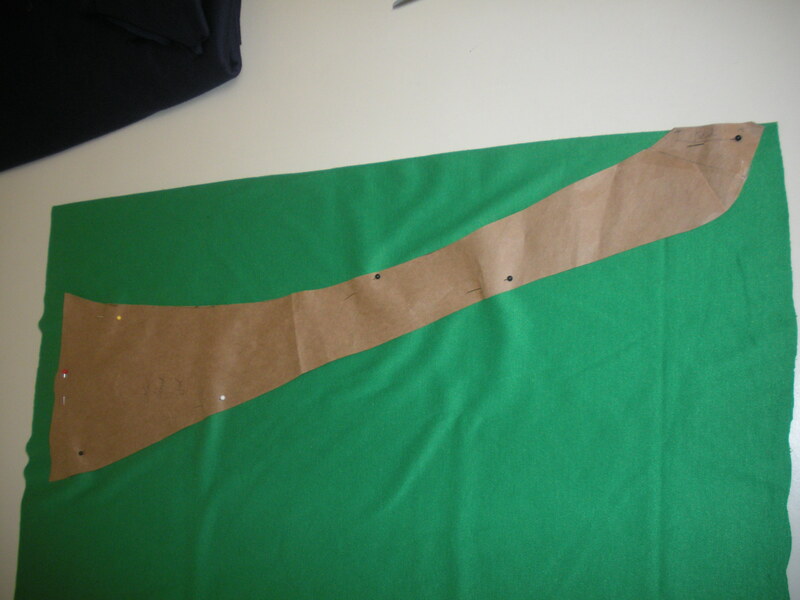 Next I placed the pattern piece on my fabric and cut it out. I bought 2 yards of the navy knit not really knowing how much I would need. I am taller than the average person (6’1) and I figured I could make something for my daughter if I had scraps (which I did). Next I decided that I needed some sort of other color so I picked up some green knit for a nice contrast. Now I experimented with this shape and ended up choosing a V shape. 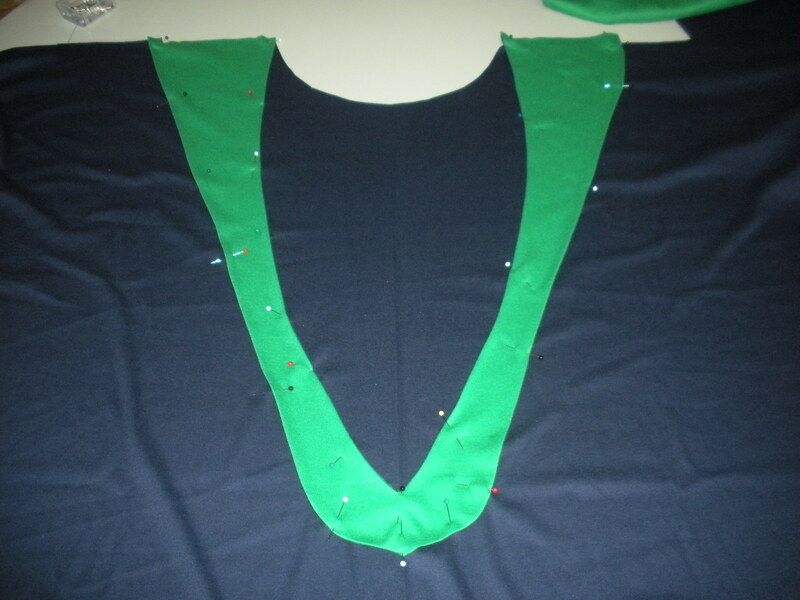 Here is the pattern piece for the V. I was going for a V with the alternating color. The skinny part of the V should be on the fold of the fabric. Also you may have to adjust the size of V to fit your skirt. I am 6’1 so your skirt will be smaller if you are shorter, therefore your V will be smaller. If you decide to fold over the edges about 1/4 inch, cut a small slit in the V .
Iron down the sides for a cleaner look if you choose. Knit won’t fray but I thought it would look better and I could cover up any cutting imperfections. Pin V onto 1 piece of the main color of the skirt. I took my time during this step and played with the location. I wanted the edges of the V to match up with the edges of the skirt. Time to sew! 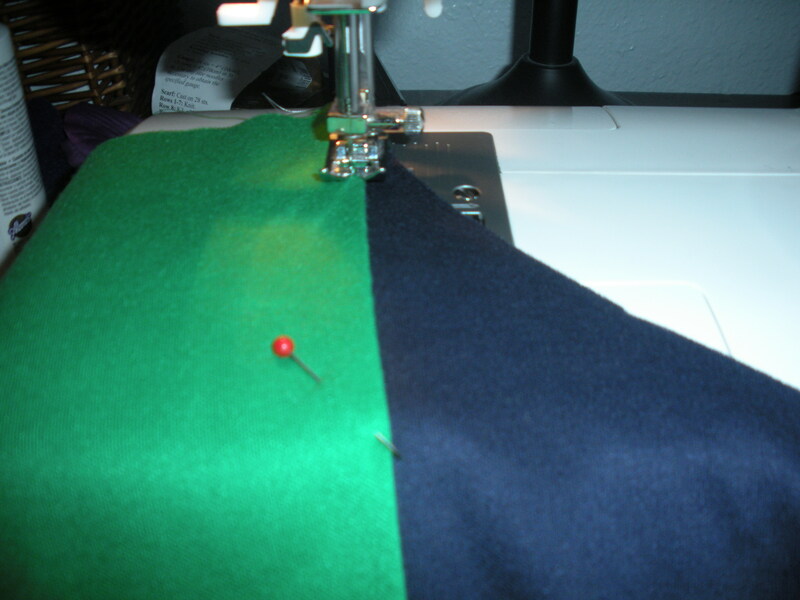 Sew the alternating color to just 1 piece of the skirt. This will be the front of your skirt. Sew as close to the edges of the V as you can. 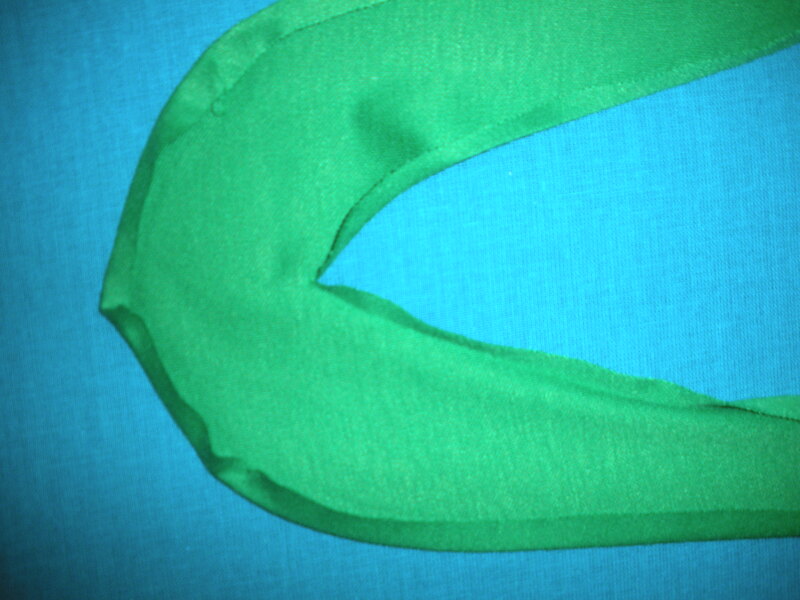 Then put right sides together and sew/serge your side seams. Again knit won’t fray so serging is not necessary. Next you need to make your waist band. Sew side seams together. 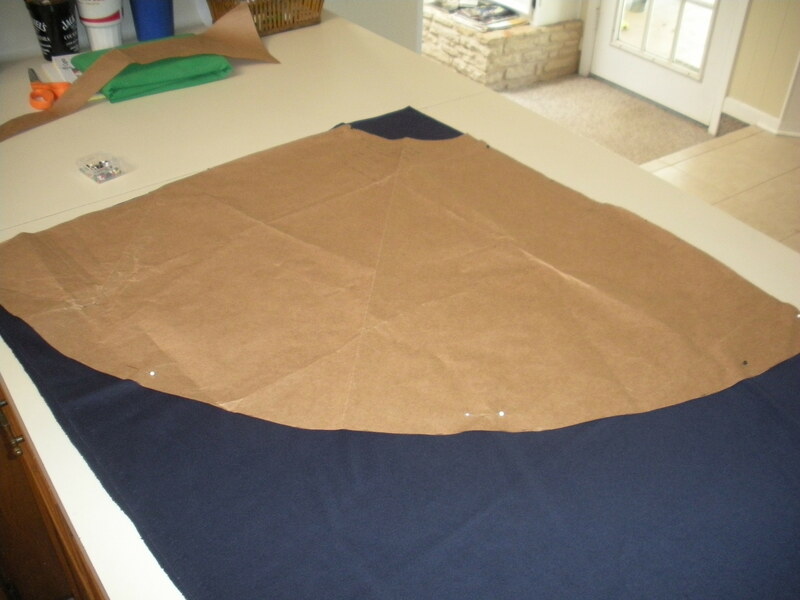 Fold in half, iron the seam if you would like and pin right sides of the skirt and waistband together matching fray edges or waistband and skirt. 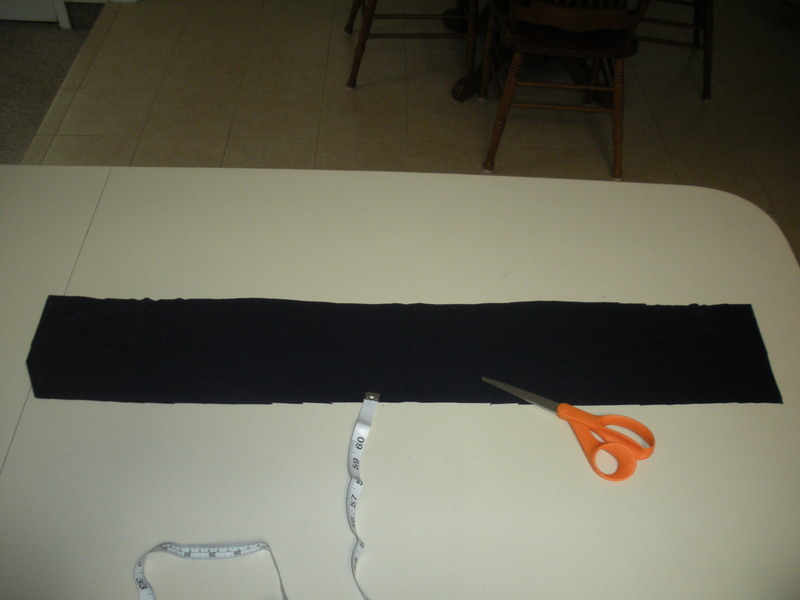 You should have 3 layers (2 from the waistband and 1 from the skirt). I followed the direction for the waistband from the tutorial but it was still too big for me. I added some 2″ elastic in the waist band. Just wrap the elastic around your waist and cut off the amount that fits your waist if you need the waistband to be tighter. Initially I thought this was too much fabric but after I put the 2″elastic to cinch in the waist the skirt looked much better on. I didn’t hem my skirt. I was very happy with how it turned out and it was super comfy. Paired with a white tank top (from the closet), an up-cycled sweater, and a homemade necklace. Tutorial for the re-puposed sweater and baby outfit out soon. Posted in Tutorials and tagged circle skirt, color block skirt, green and blue skirt, knit circle skirt, knit skirt, navy skirt. Bookmark the permalink.